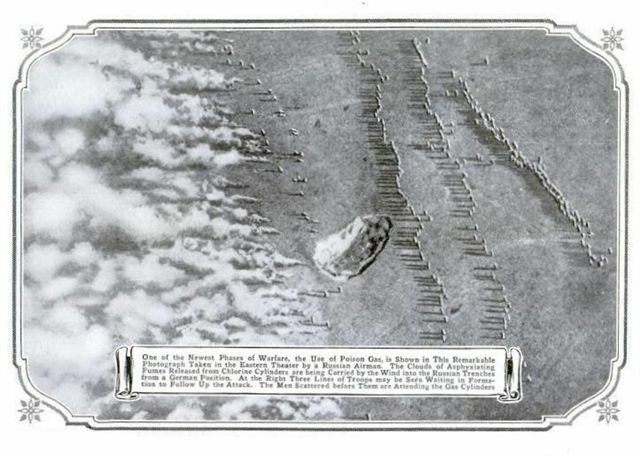 The origin of the photograph, relates to a German poison gas attack on the Eastern Front filmed by a Russian pilot. As to the gas used, one would assume the Germans did not attack using ' laughing gas ' , as their intention was to injure or kill as many of the enemy as possible using toxic gases, and if you read the list of gases used and their effects, as detailed in the link in post # 422 , you will agree all were toxic, and in many cases were deadly. With regards to the gas cloud being dense, it looks pretty dense to me. In several photographs of Germans dispersing poison gas, they are shown as being close to the gas cylinders, as they would need to be, and I am sure precautions were taken by those units, who were no doubt also wearing gas masks. 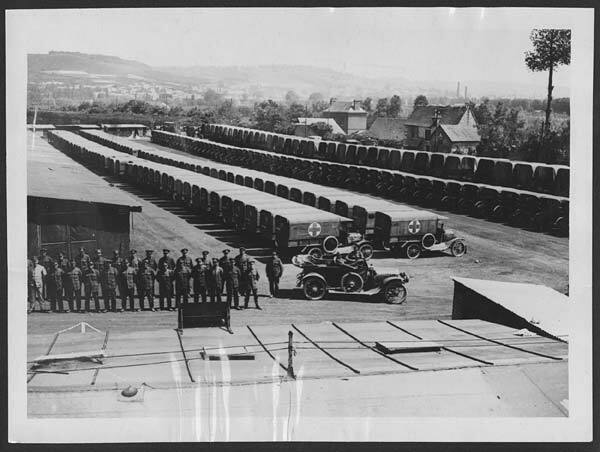 Also, if you look at the photograph carefully, and trace the gas clouds back to the cylinders, you will see that the men closest to the gas cylinders are in fact several yards behind the cylinders, and nobody, is level with the cylinders or in front of the cylinders ( except the Russians ). The photograph is undoubtedly genuine, and I have no reason to question its authenticity, and I doubt if anyone can.
" One of the newest phases of warfare, the use of poison gas is shown in this remarkable photograph taken in the Eastern Theatre by a Russian airman. 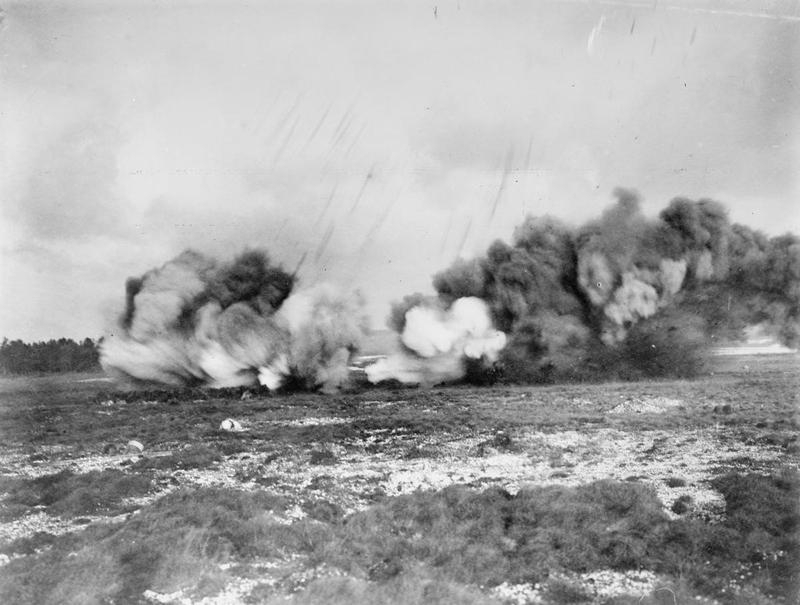 The clouds of asphyxiating fumes released from the chlorine cylinders are being carried by the wind into the Russian trenches from a German position. At the right three lines of troops may be seen waiting in formation to follow up the attack. The men scattered before them are attending the gas cylinders." I suppose it's just possible the original photograph was 'touched up' a little to give the subject matter a bit more definition - I suspect many period photos were 'improved' in this way, however I've read elsewhere on the subject of gas that it was colourless which is something I've never been able to understand, because there are a goodly number of period photos which clearly give the distinct impression the released gas formed visible clouds of itself, and in any event, if it were colourless, how would those releasing it have any idea which way it was blowing if they could not see it? I've never read that gas and smoke were systematically released together to give the gas definition? The 'clouds' don't neccessarily have to be the gas itself. If the chemicals had to be heated to form the gas it could just be vapour and steam when the hot gases hit the cold air? 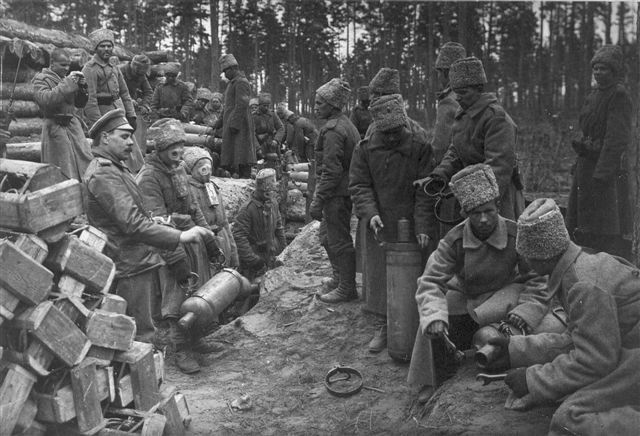 Russian soldiers prepare chlorine cylinders for a gas attack against German positions near Ilūkste, 1916. Note the gas masks being worn, presumably by those responsible for dispersing the gas. Tragic consequences of poison gas.
" British emplacement after a German gas attack ( probably Phosgene ) at Fromelles 19th July, 1916 "
German Poison Gas Cylinders, presumably, the long pipes are to keep those troops responsible for dispersing the gas as far as possible from the point of the gas' discharge. The photo is very well known but I have real doubts about the picture being an actual gas attack and I think it is of a training exercise. To start with the trench the gas is being released from does not seem very well formed for a front line trench there are no reverses or communication trenches and it’s more like a straight ditch. There are also no shell holes, barbed wire or other signs of fighting. However the clincher for me is that no one is taking any shelter and they are all standing up out of the trench in full view of the Russians. One badly aimed machine gun could cause carnage. Even with the gas I doubt the Russians would be doing nothing. It all looks too relaxed and I suspect that it’s a training exercise with troops being shown this new wonder weapon. Unfortunately, we shall never know. All we can do 100 years later is guess, or rely on the photograph captions from all those years ago, and we all know that old photograph captions are sometimes incorrect. There is, one large crater/shell hole right in the middle of the photograph ? Either way, it is still a very interesting photograph which is part of the German National Archive. 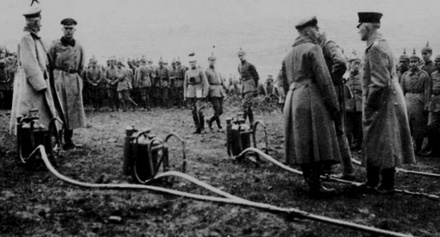 The British also used poison gas, and one of the methods of delivering the gas was the ' Livens Projector ', which was fired remotely from a battery of the projectors. 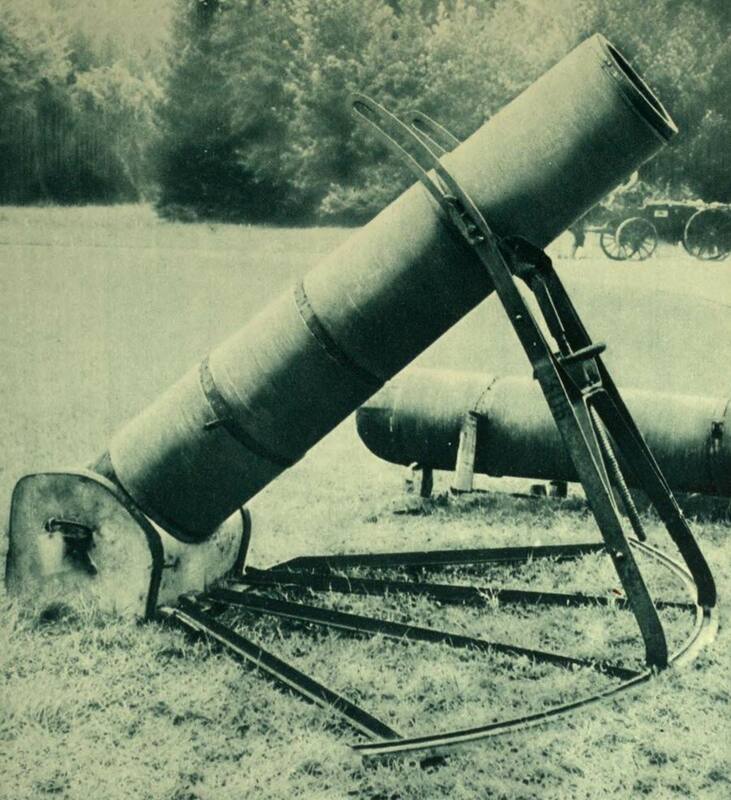 The Livens Projector was a simple mortar-like weapon that could throw large drums filled with flammable or toxic chemicals.In WW1, the Livens Projector became the standard means of delivering gas attacks, and it remained in the arsenal of the British Army until the early years of WW2. 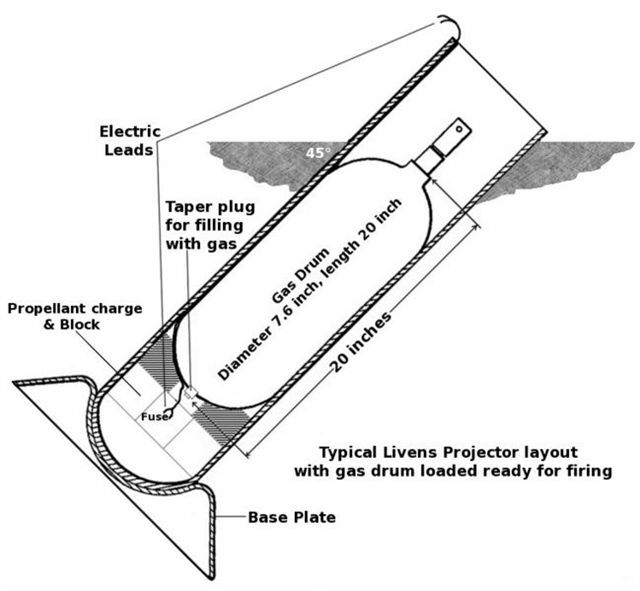 A typical Livens Projector battery emplacement, and a projector battery being fired. British soldiers loading a battery of Livens Gas Projectors. Photographs taken at Royal Engineers Experimental Station, Porton, UK. William Howard Livens, D.S.O., M.C., inventor of the Livens Projector.
" William Howard Livens, D.S.O., M.C. (born 28th March 1889 – died 1st February 1964 ) was an engineer, and soldier and an inventor particularly known for the design of chemical warfare and flame warfare weapons. Livens is best known for inventing the ' Livens Projector ', a simple mortar-like weapon that could throw large drums filled with inflammable or toxic chemicals. In World War I, the Livens Projector became the standard means of delivering gas attacks and it remained in the arsenal of the British army until the early years of the WW2. Educated at Oundle School in Northamptonshire, where he enrolled in the Officer Training Corps (OTC) wherein he served with the rank of sergeant. On leaving school in 1908, Livens went to Christ's College at the University of Cambridge from 1908 to October 1911. There he enrolled in the college OTC and served with the rank of private, and he was captain of the Cambridge rifle team. He was a crack shot with a rifle, making a record score in a competition with a team from Oxford University, he was also an excellent shot with a pistol. Livens trained as civil engineer, and was for a while an assistant editor for Country Life magazine.At the outbreak of WW1, he joined the Army. On 4 August 1914, on graduating from the Officer Training Corps, Livens applied for a commission in the Royal Engineers. He was commissioned as a Second Lieutenant on 30 September 1914, and was given a clerical post in the Motorcycle signalling section at Chatham. With his engineering background he turned his mind to the problem of making better weapons. On his own initiative, he fitted out makeshift laboratories at his Chatham barracks bedroom and in the officers' garage. For a firing range he used vacant land near one of the old forts which overlooked the Thames estuary.Here he worked on developing flame throwers and small mortars to throw oil and gas. Livens left Chatham to join one of the newly formed Royal Engineer Special Gas Companies where he was one of very few officers to have a background in engineering rather than chemistry. 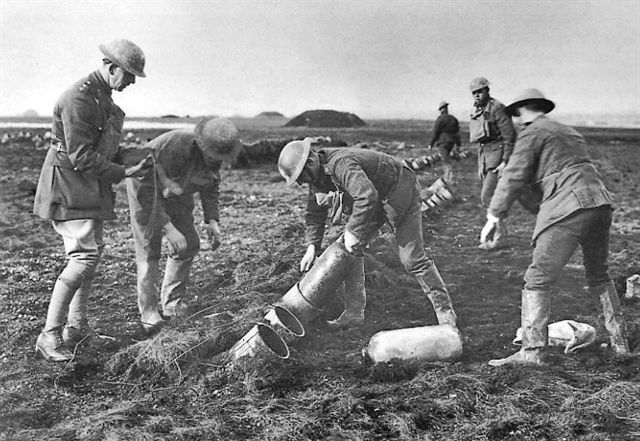 At the time, gas warfare was very primitive: heavy cylinders of poison gas were manhandled to the front trenches and their contents simply vented out through metal pipes relying on a breeze to carry the toxic cloud over the enemy trenches. 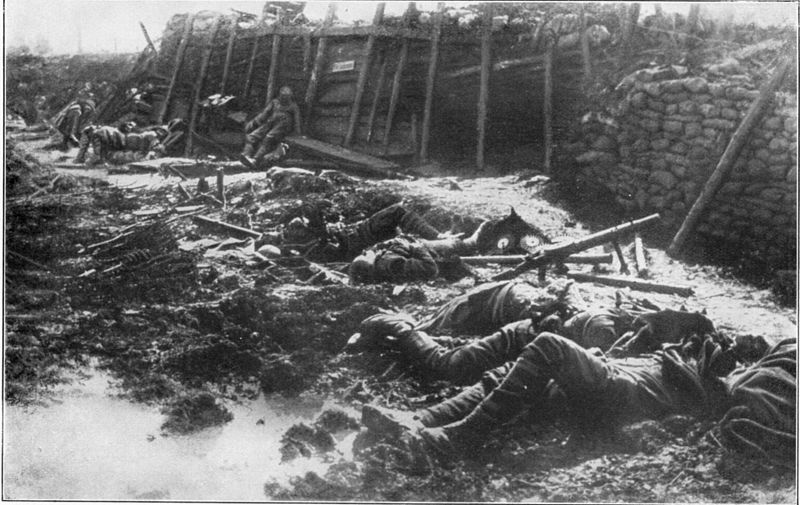 But the wind could be fickle and change in its direction: the first British gas attack at Loos was a disaster. Livens developed the use of long rubber hoses to carry the gas to an optimum location for release and of a manifold that reduced the number of parapet pipes by connecting four cylinders to a single pipe, these improvements helped make the system more reliable. One day, during an attack on the Somme, Z company encountered a party of Germans who were well dug in. 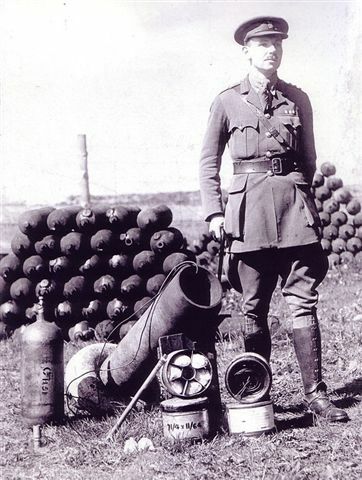 Grenades did not succeed in shifting them, so Livens threw in two five gallon oil drums; the burning oil was so effective that Livens' comrade, Harry Strange, wondered whether it would be better to use containers to carry the flame to the enemy rather than relying on a complex flame thrower. Reflecting on the incident, Livens and Strange considered how a really large shell filled with fuel might be thrown. Although the key idea of throwing a large container of oil was due to Strange, it was Livens who went on to develop a large, but simple, mortar that could throw a three gallon drum of oil which would burst when it landed. 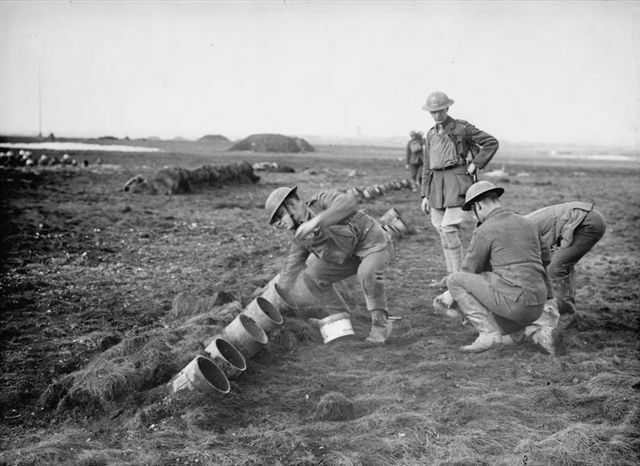 He did this by throwing it out of extemporised mortars which consisted of the ordinary steel containers in which his oil was received, other oil-drums of slightly less diameter and wrapped in sand-bags being employed as projectiles. 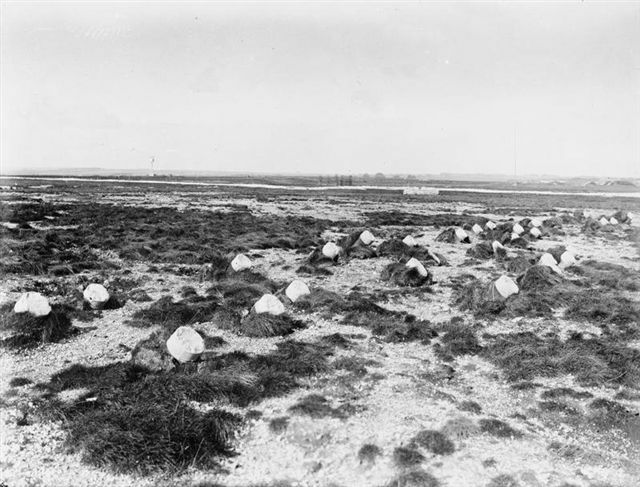 The mortars were buried in the ground in rows, almost touching each other and with only the muzzles visible above the surface, and in this manner they were set in the required direction, while pieces of metal from any that happened to burst—of which there were quite a number!—were prevented from flying about. The drums were filled with oil and cotton-waste, and they were opened up and contents were lighted and scattered by charges of gun-cotton fixed to the surface and detonated through lengths of time fuse which were lighted by the flash from the black powder propellant charge." The new weapon was developed into the Livens Projector which consisted of a simple tube closed by a hemisphere at one end. It was half buried in the ground at an angle of 45 degrees and pointing in the required direction. It was then loaded with a single shot with an amount of propellant calculated to effect the desired range. Preparing a battery of projectors for an attack required a lot of preparation, this was not a serious problem in the conditions of static trench warfare and the weapon was so simple and inexpensive that hundreds – and on occasions thousands – of projectors could be fired simultaneously catching the enemy by surprise. Z Company rapidly developed the Livens Projector, increasing its range from the original 200 yards (180 m), first to 350 yards (320 m) and they eventually produced an electrically triggered version with a range of 1,300 yards (1,200 m). The Livens Projector was modified to fire canisters of poison gas rather than oil. This system was tried in secret, at Thiepval in September 1916 and Beaumont-Hamel in November. The Livens Projector was able to deliver a high concentration of gas a considerable distance and each canister delivered as much gas as several chemical warfare artillery shells. The Livens Projector was used in a series of gas attacks during October 1916 and a number of officers took a close interest in the results. Livens had witnessed some projector firings from the vantage of an aircraft and in his report he estimated that "…if the projectors were used on a large scale the cost of killing Germans could be reduced to sixteen shillings each." This report was sent to the Ministry of Munitions and Livens was returned to England soon afterwards to help develop a standard projector and drum. The Livens Projector became a preferred means by which the British Army delivered a chemical attack and its production was given a high priority, the total for the Allies of the Great War eventually exceeded 150,000 units. Livens, "who was always full of ideas" gave up the command of Z company and became a liaison officer between Foulkes' Special Brigade and the Ministry of Munitions, in which role he remained for the last two years of the war. Livens was awarded the Military Cross on 14 January 1916 and the Distinguished Service Order on 1 January 1918.Livens was demobilised from the army on 11 April 1919. " The Livens was manufactured and stock piled for WW2 as well - bur fortunately never used. The Germans built a copy of the Livens in two sizes but were unable to mass produce the requisite quality of steel in sufficient quantities so relatively few were used. An alternative German approach was the wooden mortar. 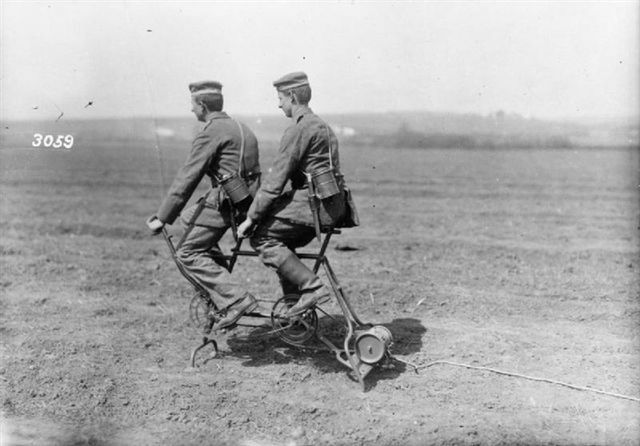 An alternative form of motor power - German soldiers pedal the Tandem Bicycle Power Generator used for Field Wireless Sections. 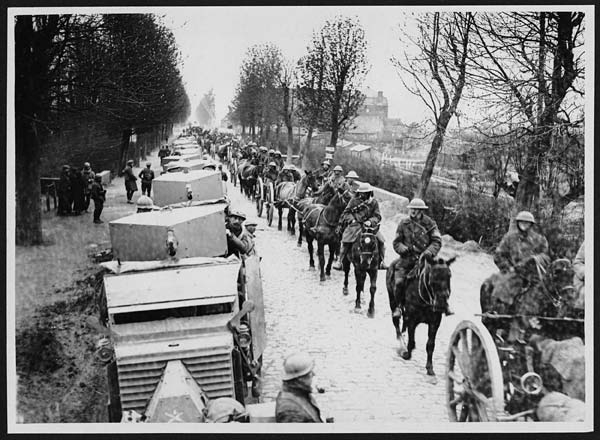 An excellent photograph to illustrate the enormous amount of vehicles that were needed to sustain just the medical transport section of the war effort, with 200 or more military ambulances lined up awaiting distribution somewhere in France. Original caption reads: 'OFFICIAL PHOTOGRAPH TAKEN ON THE BRITISH WESTERN FRONT IN FRANCE. Motor Transport work in France. 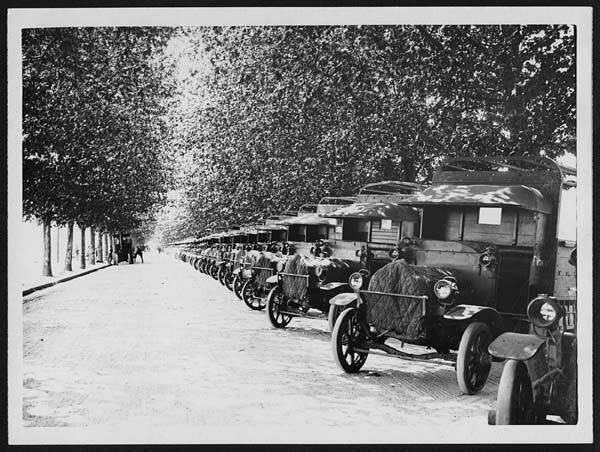 A park of vehicles ready for issue'. As early as 1902 the War Office had an interest in military portable wireless stations, and official military tests were undertaken. Those tests resulted in transportable wireless stations being used by the British Army during manoeuvres in 1903. These ' Marconi ' transportable sets used demountable umbrella type antennas, syntonic transmitters and magnetic detector reception. 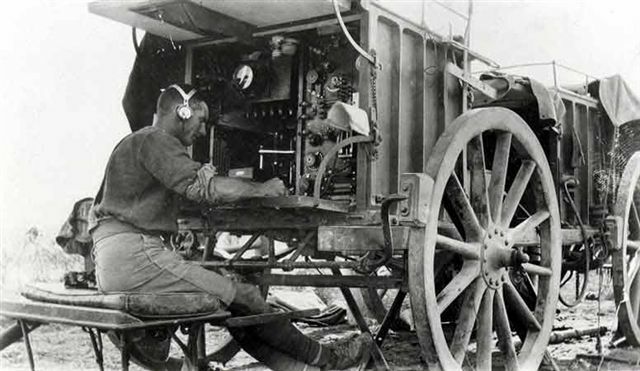 The Army's wireless stations were carried by horse-drawn wagons, later the Army looked at developing transportable wireless stations housed in motor vehicles and motor cycles. The 1914 Marconi 1500 Watt Wireless Transmitter Wagon was articulated and had two compartments, one for the wireless equipment and one for the accumulators. The accumulators were either swapped out on location and taken away to be charged in a central charging station, or a mobile charger came around each day to each location. 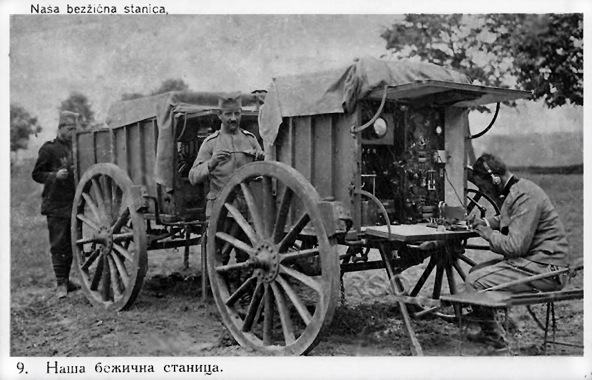 During WW1, Britain provided her Allies with military equipment, and in the attached photograph we see a British 1500 Watt Wireless Transmitter Wagon being used by the Serbians. 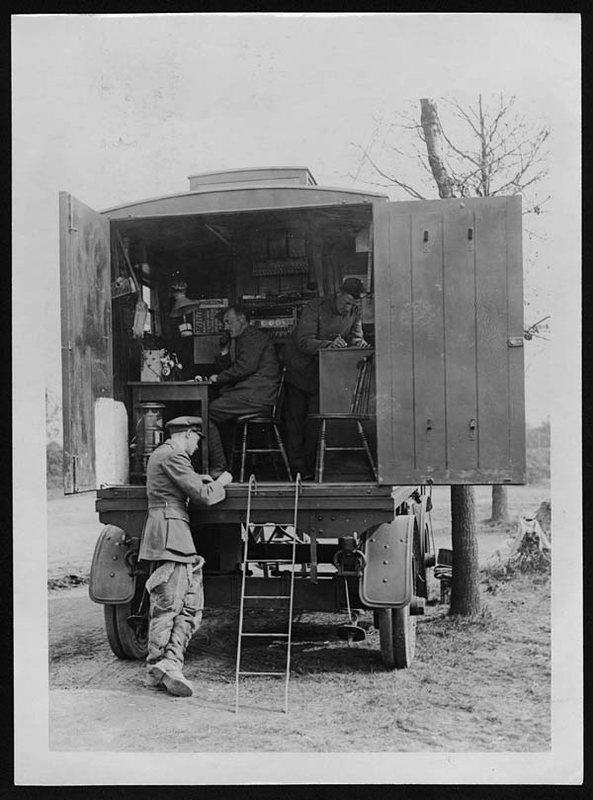 British military ( RFC ) mobile telephone exchange, being used during an Observation Balloon exercise in France, during World War I. The mobile telephone exchange was used for telephone communication between the Balloon Observers aloft , and the ground crew. The Officer standing at the back of the motor vehicle is a Balloon Observer, note he is wearing the sheepskin high boots worn by Observers as protection against the cold at high altitude. British Observers, in the basket of an observation balloon during a training exercise in France during WW1, using telephone equipment to communicate with their ground crew. Attached to the side of the basket in their container, are the early version of the escape parachute, one for each person. Observers, equipped with cameras, sketchpads and a wireless telephone set were sent up in wicker baskets suspended from a hydrogen filled Observation Balloon, to identify enemy troop movements and other strategic targets. Usually, the two man crew could see as far as forty miles and were able to direct their artillery to enemy targets on the ground, identify enemy troop movements, and locate enemy planes, and as such, they were important high profile targets for the enemy. Although the Observation Balloon and their Observers were at great risk, they were highly protected by ground AA Gun Batteries and long range machine guns, and floating at the then high altitude of some 4000 feet, it was difficult for an enemy plane to attack an Observation Balloon and make a safe escape. Ordinary rifle fire, could pass harmlessly through the hydrogen filled balloon causing damage but not immediate destruction. The Observation Balloons were tethered to the ground by means of a winch vehicle, and could be pulled down quickly by the ground crew using a motorized winch immediately an enemy fighter plane was spotted. The risks to the balloon's crew were still enormous, as they hung in a small wicker basket suspended under the huge hydrogen filled target. Although escape parachutes were provided, an early parachute invention being the ' Spencer ' parachute, they initially had a high failure rate, and Observers could only jump from the wicker basket in dire emergencies. 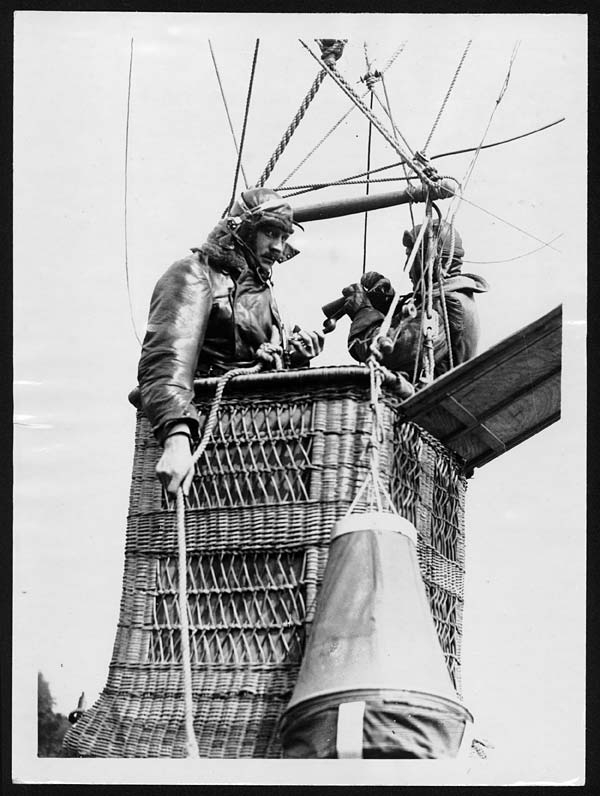 The first parachutes were not worn in packs attached to the back, but were rather hung from the side of the wicker basket housed in a container, and could be accessed in the event of an emergency. 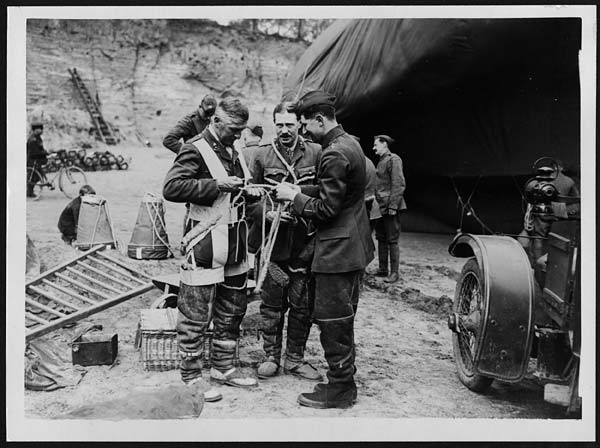 In the first of the attached two photographs, we see two Observers having their harness fitted and checked by the RFC ground crew, we can also see on the right the Observation Balloon and the front of the Winch Vehicle. Also note the 2 parachute containers on the ground, and the sheepskin high boots worn by the Observers for necessary protection against the cold at high altitude. 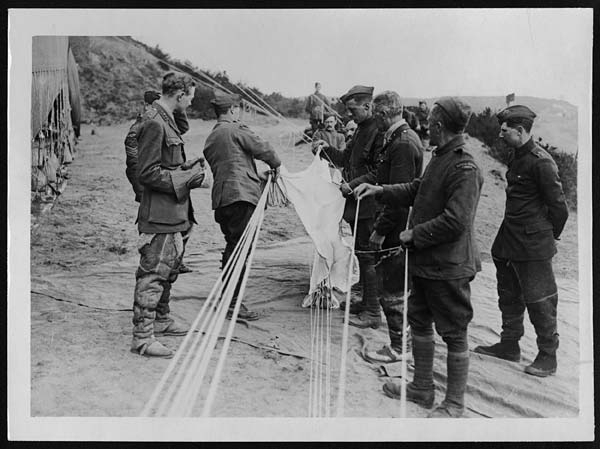 In the second photo, we see an Observer carefully watching the packing of his all important escape parachute by RFC ground crew, and behind him to his left, we can see the tethered Observation Balloon fitted with sandbag weights. You're begining to repeat other threads which is tedious http://1914-1918.invisionzone.com/forums/index.php?showtopic=156411#entry1509268 If there is nothing new to say just post a link. Firstly, I have never seen your old ' Parachute ' Thread before. Secondly, not one of the photographs I posted, photographs being my main area of interest, were posted in your old Thread. Perhaps your real complaint is that you find it tedious because you have posted over 20,000 posts covering just about every conceivable subject, and you will of course inevitably see other members touching on those same subjects, which hopefully will bring new information to those old topics and new photographs which were not part of those old topics, which surely, is to everyone's benefit. Perhaps, you are over posting, and by doing so, you are leaving very little room for other members to cover a subject you have not already covered by one of your previous posts. No one member can claim exclusive rights to a topic, and in many cases other members, as in my case, may be completely unaware of your old Threads. I am sure this Thread will again, at sometime, inevitably touch on topics you have previously covered, please then have the courtesy to understand that may happen, and it is not done intentionally. If at some point your ' tediousness ' becomes unbearable, do not click on this Thread, and that way you will be spared the boredom of viewing. I shall continue to post information and photographs on matters that interest me personally, and which I hope may be of some interest to other members also.